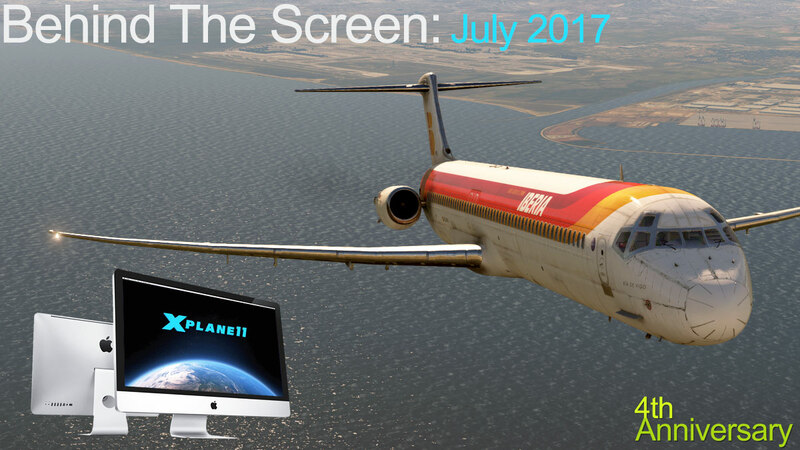 This edition of "Behind The Screen" brings X-PlaneReviews to its 4th Anniversary or four years into the world of X-Plane simulation and all its glories. 1st August 2013 was the start date and here we still are in 2017. I am surprised more than you would be actually. My usual personality was that I would totally devour any fascination with something within months, then move my attention quickly on to something else and then devour that, so I expected my then X-Plane fad to pass within a few months, soon bored and then wanting even more simulation from another source and that is how I have lived my life. But no here I still am and that from my perspective that is eternally fascinating. The so called fad started earlier, back in 2011. A Mac Mini and X-Plane9, then my trusty iMac of which still all the X-PlaneReviews work is still outputted from, but a move to Windows was required to run X-Plane in a serious requirement for the site. Before X-PlaneReviews I wrote for XSimReviews, a crazy place with Simon and Chip but a great introduction to the X-Plane community, then a short spell with ASN (Aerosoft Sim News) but then the option to run my own site was a call from the ether and thus X-PlaneReviews was created 1st August 2013. So then why am I still doing X-Plane. Why still the total fascination with a simulation program for aircraft? My first reasons was to fly, or fly correctly. Being slightly deaf since childhood an actual career in aviation was never going to happen, but I love aviation in all its forms. The odd thing was that I was pointed to X-Plane because it was the best simulator for a Mac, I tried early Microsoft simulators and Fly! but I have been always a Steve Jobs believer (even through the weird times) and so X-Plane it had to be. In some ways I saw the Steve Jobs vs the monolith Microsoft as part of the X-Plane to Flight Simulator or the creative vs monopoly and I still think that is still relative, but like Apple then X-Plane is getting the traction with the best product. But it still comes back to the point of why am I still totally fascinated with X-Plane. There are a load of reasons, but basically the simulator is still totally endlessly interesting, very creative and very diverse. You don't have to be totally in love with aviation to be part of it (though that does help) but it does attract very creative people willing to donate their time. Many move up higher to not only contributing to X-Plane but making their living from it. Let us get this straight that no one will ever be made rich from X-Plane except for maybe Laminar Research, but that is missing the whole point on why it actually works. There is always a lot of comment out in the world that life is better when you have stuff, bigger house, better car and a load of cash in the bank, it helps of course but in reality it is a very empty existence, our world today is built in to create status and yet in reality do we really admire tossers that in reality contribute nothing but only take for their own vanity and undeserved accolades for being in reality only shallow human beings, and for some reason these tossers actually think they are better than you and me for reasons only known to their selfish selves. X-Plane is actually the opposite of that, and thankfully the simulator does show that a.. human beings can actually get along with each other, b.. that there are no racial or continental barriers and that we live in a brilliant unthought of online electronic world were we are all connected together by one endeavour to do something that we all can participate in together with a common goal in to learn, be creative and to contribute. X-Plane is the internet dream come true in reality, a modern day society and an entity to itself. There is no doubt more and even bigger online societies than X-Plane, but it is its ideals and goals that give it a status we should all be proud of. More importantly is the fact the simulator is fulfilling, by giving you receive, X-Plane gives you something you can't buy... happiness. X-PlaneReviews and in fact my reasoning for being part of X-Plane is to be part of the living organism and give to build a better place for people to enjoy a community. The aim of the site is to promote peoples creativity, guide and to showcase what X-Plane has to offer the world. My place is not to put myself on a pedestal and say this or that is good or not. Obviously as the standards in the simulator are getting now to a very high level, certainly as X-Plane11 takes the level now quite high in quality and demands. My position is to highlight the great work being done out there and what we can experience on our screens in real time flying. Photorealistic vision is now commonplace and not just in your dreams, as noted the standards are now extremely high, and to a point a high barrier for any new budding developer that wants to enter the market. This is now far removed from the time I started in X-Plane, the basics in reality has not changed, but everything else has. My contribution with this site is to showcase X-Plane to the world and spread the gospel, but also to be source of information to enhance your simulation experience. To a point a lot of it is very complicated and needs to be explained in layman's terms but it is in the hints and the way I use X-Plane that others can get the very best out of the simulator as well. The site has always promoted talent and creativity, and although I would like to cover almost everything released for X-Plane but that is simply not possible. So I see the site as a sort of filter to what is very good to brilliant, or items that do have potential in X-Plane in the future, or simply what is very good does always rise to the top. This does result in most times that reviews are more to the positive than the negative, that is because I mostly only filter out the areas that are in the average or to not waste your time on. Opinions and criticism is an interesting area, we are a review site, but the points are that we are reviewing the items for two audiences, one the paying purchasers and two the creators and developers of the product for X-Plane. For the first you want an overall view of the product you are paying for and is it worth your hard earned cash. The important element to our reviews which I have stated numerous times is what I call the "value" aspect of what you purchase. Anything bought has no value unless you use it, and often. Scenery is the most notable because it is out there somewhere unless you actually fly there, if you never fly there then it is waste of money and to those who do hoard huge collections of scenery freeware or not, then it still has no value unless you use it and the same with aircraft in the fact if you don't fly it it has been a waste of cash. So purchase or download only what you will actually use, and build up clever networks that take full advantage of the X-Plane experience, I know because I was the worst hoarder ever... I mean ever! Reviews of developers products is a harder game. No one and certainly not me wants to criticise someone's great work and worse have them have the loss of sales at the release, this is their reward time after all. But the aim is to be fair to both parties. The buyers deserve something good for their cash and in my mind at least a certain level of quality and features for the purchase price, the problem is as noted is that the level is going up and up and is now quite high. But let us be frank that some of developers are asking more than their actual product is worth for the return on their investment, a bigger problem lately is that to many developers are now releasing product before they are ready for the market and then get really annoyed when you point that actual fact out, the "I'll release it and fix it up later" is better left to Apple and other online business than X-Plane. Certainly I understand that everything in X-Plane is always under development and nothing is in reality is ever finished, but the prospect of cash coming in can in most cases totally override the point of reason in that the product usually only needed a more short points of time to clean up the and fine tune the product and it is usually only a few months extra work for bigger sales. They just don't see that a reputation is hard earned and is just as easily lost by assuming that the punters will simply buy what they put in front of them and are aghast in the fact that reviewers will note that their product is not actually ready for sale. But come to their next release and the punters are certainly are going to be wary even if the product is far better. Reputation is consistency and quality, get the equation right and you will do well, the best and successful developers are the ones that take care of the tiny details as much as as the broad canvas. Some developers do get your admiration as well. They release, but work quickly and efficiently to deliver a fully rounded product in a short period of time and quickly do sort out the areas of bugs and details. So criticism is a fine line between noting the issues and not deriding the product, an issue is an issue to be faced and fixed, If you don't note it then a thousand voices on the forums will tell you anyway and there is the point to be made. X-PlaneReviews does note that, It is not a personal vendetta on any developer or product, but the simple fact there are areas to be addressed on the product and its purchase price, and that X-PlaneReviews is still here after four years and for many more it is testament to that. Credibility is hard won in the age of "fake news" but in reality I think it is needed now more than ever to give users the best information and the best ideas that X-Plane has to offer, but overall the past four years the development has been astounding and more this year than any of my past time in X-Plane have I had with no exaggeration more jawdropping experiences from the return from the simulator. The X-PlaneReviews site has evolved as well. On the surface the layout has not changed that much in many ways, but it has in lots of others. We are bound by the IPB board systems layouts, but that is to our advantages and not the negatives. Yes we have twiddled with various ideas and layouts, but the one we use is there for a reason. The main objective is that the site is available to everyone and everywhere. Yes we could have loads of fancy huge graphics (I am a graphic designer) and loads of buzzy animation, but the site is built around speed to download, and to be perfectly available on every platform from desktop to smartphones to tablets and any other portable device we use. There is no use in have big expensive graphics if you can't scale them on to the various different devices, and what looks nice on a desktop, is mostly horrible on an iPhone or iPad, so simple layouts do have a job to do and we have worked very hard not only in the look of the site but in the way the reviews are actually laid out on all the platforms. Changes on the IPB have helped in site over the years as well, but the biggest has been the ability to size the images in the site. This aspect gives you the flexibility to highlight areas in the review, but in most cases just to show off the great images you can now achieve in X-Plane, which are almost photographic quality in X-Plane11. One area that is a minor note is that every now and again the IPB will do an in house update. These updates over the last few years have created a few visual issues in the way the layouts are set out in the reviews. They scrunch up was they lose their spacing and a few graphics in logos have disappeared? The reviews can be edited back to their correct form and we endeavour to cover them all, but we did do them and then the IPB reupdated and sent them all back to zero again, so yes a few reviews are not laid out correctly, but we are getting through them and reediting (again) them back to their correct form. Problem is there are over a thousand reviews now, so it takes time to fix them all up. Overall it is the sheer change the X-Plane simulator has created within the years that have been part of the experience. When I started most simulation punters were noting the end of the desktop simulation and that the golden years were now behind it. The naysayers went on and on that the shrinking hoards were going to other areas to get their thrills. Personally I think that is a load of tosh. In fact X-Plane when I joined had only 183.000 registered users, currently officially there are 464,709 registered users and yes a certain amount of the registrations are not regular users, but the numbers are still rising, still joining and X-Plane will certainly pass half a million users by the years end. That is not simulation in retreat. You feel it in reviewing as well. When I started reviewing you had maybe a major payware release twice a year, maybe three. Now it is mostly bi-monthly with groups of major releases before the Christmas and Easter holidays. Mostly there was a feature release of say a scenery or plugin twice a month, now it is mostly three a week, we used to have slow periods and heavy periods, now you are busy every week, every day. Most weeks we try to post two to three reviews, so take a few days off or have a holiday (ha!) and you quickly fall behind. There is certainly an enormous amount of information to process, a huge amount to learn and layout for you to read. And the sheer depth of the simulation now in X-Plane was simply unthinkable when I started. Setting up scenery and certainly aircraft does take time. Most high-end aircraft take around twenty minutes even before you start the engines, just like the real thing and if your computer is having an off day and won't co-operate even if you yell at it, then it gets all a little of "hows your father". A few tricks can save time. I try to vary the reviews as much as I can to not bore you to death with the same scenery and viewpoints. But solid routes can and does help in comparison between the different versions of the same aircraft and it does a sort of continuity in the same theme. But a lot of the time is wasted in programming out FMS (Flight Management System) navigation systems. I have created cheat sheets that covers all SID/STAR and waypoints with required the frequencies for certain routes. The main area that you lose time is finding correctly working waypoints and SID and STAR routes, certainly you can download routes from the internet, but these are tried and tested inputs that will deliver the complete gate to gate required route without any complications across a variety of aircraft. It works, but mostly in the fact that when I input the route in it will not give me an error to be found in a non-existent fix or a STAR that is not correct with the runway (A lot of STAR's will turn you in too close to the runway or send you miles away to an odd entry fix, just try LIRF if you want to have some fun). But the wonderlust does still happen, that draw that should have faded years ago is still there, not flying and you get ichy, even addictive, you just want more and X-Plane is the drug that just keeps on giving... I just hope I don't end up in Rehab! I nearly did end up in care in July. After a heavy six months my eyesight finally gave up early in the month after another bad cold in late May that I never really got over. Blurred vision, bad headaches and a drop in eyesight meant I needed new glasses. But it was still a week with the old ones till they arrived. Then the last week of July I got another cold that floored me again and this is the third this year... I am so over colds. It was a busy month as well with plenty of releases, with some really great scenery including LAXv2, Salvador Bahia and ENBR-Bergen Norway. The X-Plane11 compatibility aircraft roll-out continued as well with aircraft from Carenado with their B1900D, B200 and PA-34 Seneca V. Rotate updated their amazing MD88 Pro to v1.31 and SSG updated their E-170 and B748 and Wilson's Aircraft DC-8 got the compatibility make over as well. I really liked the work in progress DC-3 by VSKYLABs, Great to fly, but slightly hindered by average textures, I think it is a great DC-3 for X-Plane and one aircraft to watch and at that price a real steal if there ever was one, it was an aircraft you just couldn't forget or want to move on from. So there was a few reviews I didn't get around to in July because of the colds and don't mention a summer holiday will help. I live in Australia and it is winter here (like in Games of Thrones) and not in the hot throws of summer, so hopefully August will be a time to catchup. I am still in throes with XPRealistic Pro's, amazing effects and did a landing at SBSV Salvador in the default B737 that I replay to death just to experience it over and over again, well worth the money. I am still a huge fan of xEnviro, but the developers are wearing a lot of users patience really thin in July almost to the point of breaking point. Their instance to wait for the next update in 1.07 is fine, but it is eight months since the last update? The real issue is their insistence of the plugin being directly connected to their server to work, fine, but again if the server goes off line which it has done three times in July then you get a bad CTD (Crash To Desktop) on either starting up XP or in mid-flight. I myself lost a full days work because the sever was off line for a full day, then the work had to be totally redone to match when the server came back on-line, xEnviro has its moments with frame-rate crashes in X-Plane11 as well, that also needs an update... And here is crux of the problem. The xEnviro team is doing itself no service and other developers should to take note on how to NOT create a good reputation and the subsequent loss of future sales by not doing a simple service update. The problem is worse by the fact xEnviro have boxed themselves into a corner in the fact that the big update coming is now months overdue as problems arose, and those problems are compounded that the big update is too far along now to fix even the basic areas that need addressing. The lesson to all developers here is keep it simple and have regular updates. Just an earlier simple update to bring the plugin up to X-Plane11 compatible and unlink the plugin from the server if it is down, would have saved them (and us) a lot of torment. Users would have been more than happy to wait a longer period for the bigger featured update as their current "updated" version still runs nicely along, instead xEnviro gets a lot of very bad press every time it does a donkey and a lot of flack... and to be honest it is mess of their own creation... that is the lesson to be learn't, but will they learn it? So July 2017 was a chaotic month, but with X-PlaneReviews starting into it's fifth year we will move on and to something bigger and better. The site is as always reliant of other people to function. First thanks goes out to all the developers that give out such outstanding work, they all have created this amazing intimate world with their creativity. I spend a lot of time with many of them, and although they wonder why I am there suddenly 100% then disappear only to reappear again later and it is that because there are so many projects ongoing, and I try to follow all of them, but time is limited. Overall I try to see for the benefits of X-Plane on how the work is going forward. Laminar Research is always a foundation we constantly complain about, but in reality they have really delivered in the last few years. It is a far more professional business today than when I entered X-Plane. Give them a round of applause I think they have deserved it. The X-Plane.Org and the X-Plane.OrgStore is the centre of our X-Plane universe, take both out of the equation and would X-Plane be were it is today, would this site even exist? I would doubt it. A lot of users note it is a monolith, but I see it as a steady hand in allowing the simulator to thrive as passionate people give a lot of their free time to help and give service to so many others, both Laminar Research and the X-Plane.Org are two binary stars orbiting each other that keeps the balance and the X-Plane engine running, surviving, so it is important we support both. I have no problem in saying X-PlaneReviews supports the X-Plane.OrgStore because they do supply a lot of the releases for reviews, it allows us to cover a far larger area than most review sites, but my real reason for supporting the X-Plane.OrgStore is because it supports X-Plane in the best way it can in service, and developers trust it and the users do as well, in other words it is a sound foundation you can rely on and that is a rare thing in this day and age. But overall it is the users, you that make X-Plane work... see you all next month.